Nurture Pro Nourish Life Chicken Formula is ideal for kittens, adult cats, and felines with shedding and hairball issues. 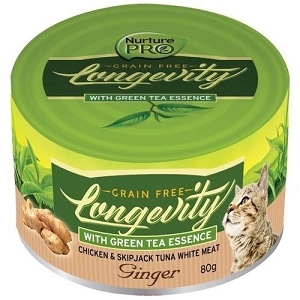 This recipe has a double protein blend of Deboned Chicken and Herring that will satisfy even the pickiest feline. 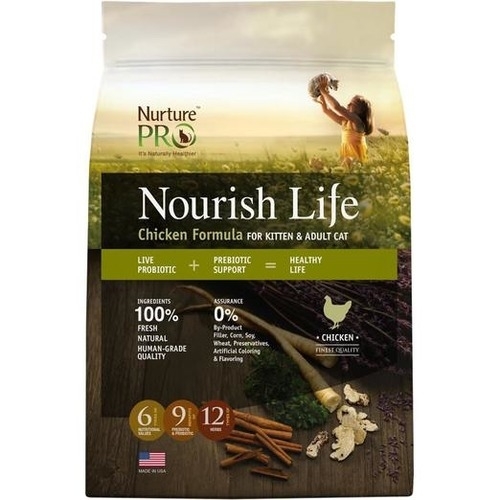 Nurture Pro Nourish Life Chicken Formula is ideal for kittens, adult cats, and felines with shedding and hairball issues. Have your beloved felines purring with delight each time you feed them the popular Chicken Formula for kittens and adult cats. Boasting a winning formula of vitamins, antioxidants, essential nutrients and natural herbs, cats love the taste, while owners are proud of the results! Prebiotic is the food source of probiotic. Having both in our formulas ensures that the probiotic in the intestinal tract can continue to flourish and maintain an ideal good bacteria ratio. The good bacteria forms a protection layer around the intestinal tract to fight against diseases and prevents harmful bacteria from entering. These bacteria also helps to increase nutritional absorption, expel bacteria and slow down the ageing process. It creates an optimum condition for your pets' digestive health and increases its immunity against infections, keeping your pets strong and healthy.